Doosan Heavy Industries & Construction announced that Saline Water Conversion Corporation (SWCC) signed an agreement with Doosan for an MED unit, worth $124 million, to be constructed at the Yanbu Phase 2 Plant in the Yanbu region, 350 km north of Jeddah. Doosan will execute engineering, fabrication, installation, commissioning and all other work on an EPC (Engineering, Procurement & Construction) basis. SWCC and Doosan will collaborate on advanced technology development through the exchange of know-how and technology sharing. This project order displays the market’s recognition of the MED market, which is growing due to the low energy consumption trends. In addition to winning the project to build the world’s largest single-unit Multi-Stage Flashing (MSF) evaporator with a capacity of 20MIGD for the Ras Az Zawr Plant last year, Doosan hopes to lead the future MED desalination plant market in partnership with SWCC. In the meantime, Chairman Park Yong-hyun, in his New Year’s address, said Doosan Group is sound and strong because every one of its 38,000 employees has been doing his or her best to make the group competitive wherever it has operations around the world. The chairman said the group recorded its best performance results last year, which was significant amid uncertainties clouding the global business environment. Its sales revenue totaled 24.6 trillion won with EBIT over 1.8 trillion won and new project orders secured coming to 17.3 trillion won. Doosan Heavy, in particular, grabbed project orders one after another in such Middle East countries as the UAE and Egypt as well as India in recent years, continually expanding the number of countries in which they operate, along with Doosan Infracore, one of its affiliates, which has been doing a great job landing project orders in China and other emerging markets, making a huge contribution to the group’s EBIT hike. Other affiliates also did a great job last year, the chairman said. The group did a tremendous job last year in the area of reorganizing its global structure and system. The group launched Doosan Power System to focus on power plant construction projects in Europe, the Americas and India, and merged Doosan Construction and Doosan Mechatec to boost the group’s portfolio health, Park said. The group also renovated the accounting system to be ready for the implementation of the International Financial Reporting Standards, which will be required of all Korean firms with international operations. The group also did its best to improve its debt structure and financial infrastructure to make it more sound and stable. Under the move, the group was able to save 1.05 trillion won in cash after spending 1 trillion won in investments. “Last year, Doosan had an astounding year not only in terms of performance, but also in confirming our potential for growth and capability in many of our business areas. We became confident that our vision to enter the list of the 200 global largest enterprises in 2020 is achievable,” Park said. “This year, we will pick up where we left off last year and be able to achieve our targets including 16.6 trillion won in project order values, annual sales revenue of 27.7 trillion won and EBIT of 2.2 trillion won,” he continued. “New project orders will be down by some due to delays in order issues, but sales will be up 13 percent and EBIT will rise 22 percent, surpassing 2 trillion won for the first time. The chairman noted the four important ways to achieve the company’s goals for this year. “First, we have to strengthen our philosophy that talented people are the future in our organization and let it dominate every corner of our work. People are the core power of our future growth and valuing talented people in our group has been a management philosophy in our group for the past 115 years. We have to set up the training program for manpower,” he said. 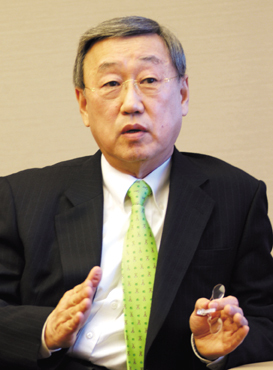 “Second,” Park said, “the group has to boost its value. It has been growing rapidly, breaking all kinds of records in the past decade except during the financial crisis. 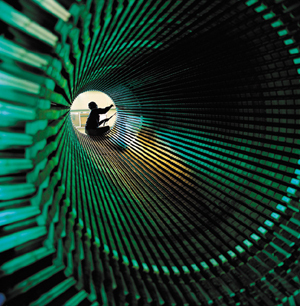 But the time has come for us to focus on quality growth, along with quantitative growth. “Third, we have to be a business group loved and respected by the people by fulfilling our social responsibility, which is required of all businesses, not just a select few. We are determined to cooperate with our SME cooperative firms to grow together through partnership in the hope that it will help Doosan Group, too. We plan to boost our cooperation with not only the first and second group of SME cooperative firms, but also all of those along the value chain for growth through companionship. Chairman Park Yong-hyun of Doosan Group delivers his New Year speech at a ceremony on Jan. 3 at the group’s head office in Seoul. (left) A view of a power generator, produced by Doosan Heavy Industries. 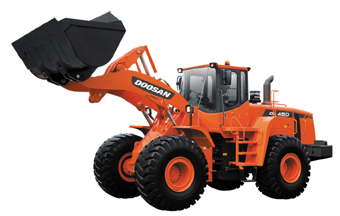 Doosan Infracore produces quality wheel loaders (seen above) and other pieces of heavy equipment.